Editor’s note: In the weeks between encountering the Linn Selekt DSM and today, some of my opinions have changed. They are included in an addendum at the bottom of this review. 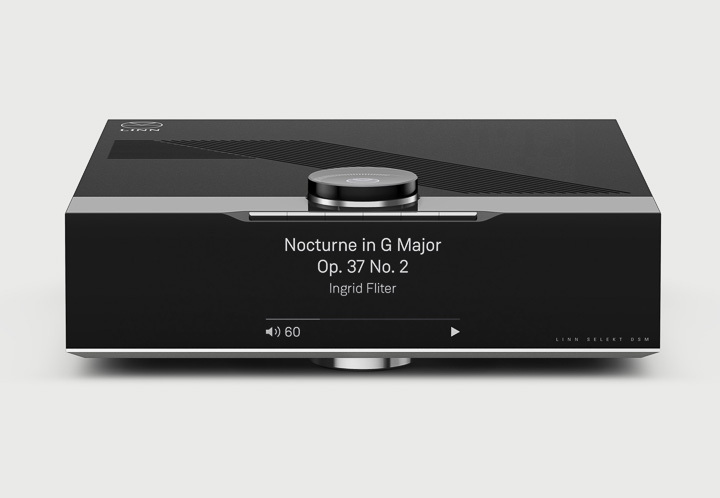 In the network streaming kennel, Linn Products is one of the alpha dogs. But, it has to be said, the DSM platform – while remaining current – is very mature… and maturity is a mixed blessing in a market that defines itself by a ‘what have you done for me lately’ approach that is locked to the product life cycles of smartphones and computers. However, Linn has been incredibly smart with the new Selekt DSM network player, in that it simultaneously makes for an upgradable, open-ended platform for the next few years, and one that sits happily in the existing product line without rendering anything obsolete. The Selekt DSM is an entirely new line of device for Linn, one that doesn’t just sit in context of other Linn equipment. It’s something of a paradox that one of the most open-source brands builds systems that are treated like a closed loop, but that loop gets broken with the Selekt DSM. This isn’t designed to be a part of an active Linn loudspeaker system, but instead as a source component in any decent audio system. With its inherent modularity, it’s possible that the Selekt DSM will grow from a source component to a better source component (with the Katalyst DAC cartridge upgrade), and then to a complete amplifier solution or headphone amplifier (to follow). But there is no expectation of the Selekt being used with any existing Linn equipment, even Linn loudspeakers. This doesn’t sound like a big thing when discussed in the context of open-ended systems, but many Linn dealers have become so conditioned to selling Linn with more Linn, just mentioning the notion of the Selekt DSM being played with KEFs or Bowers & Wilkins loudspeakers (as they were at the demonstration provided by Linn at its Waterfoot HQ in Glasgow) is tantamount to heresy. A modular system is not exactly a new thing, and not even new to Linn, but the Selekt DSM’s approach is unique all the same. Many modular approaches require a modicum of ‘tech savvy’ on the part of the installer; an unplugging of a wiring loom here, a solder tag there, a tea cup filled with 65 grub screws of different sizes... that sort of thing. Some even require the product being returned to the factory for its upgrades, something that becomes prohibitively expensive when international clients start shipping products around the world. Linn’s new approach to modularity is designed to make almost anyone fully equipped with the technological know-how to upgrade, thanks to a series of what look like AGP or PCI ports running along the rear side of the Selekt’s front panel. Undo two bolts and the top-plate slides off. Unscrew four more and the front section lifts and pivots forward, then slot and decouple the upgrade cards as you feel fit. If you move to the full Class D amplifier module set, there is a beefier encased power supply to insert, which follows along the same lines. These need to be named in the Konfig app, but that’s it. In short, if you installed your own network card (or similar) in a desktop PC and didn’t need a fire extinguisher, you could update a Linn Selekt DSM. That being said, updates and upgrades will be a job for a dealer, but this can just as easily be a home visit rather than taking the Selekt DSM back to the store. It really is that simple. In addition to taking the strain off the end user, this is considered a good thing for a dealer – they get to see your set-up first hand and might be able to offer a fresh install or upgrade tips in context, and it’s also good for them to have a ‘call out’ that isn’t depressing – most times after the initial install, dealer visits to the home are all about fixing broken things; this one’s a more positive experience all round.